Prepare to place some bets. 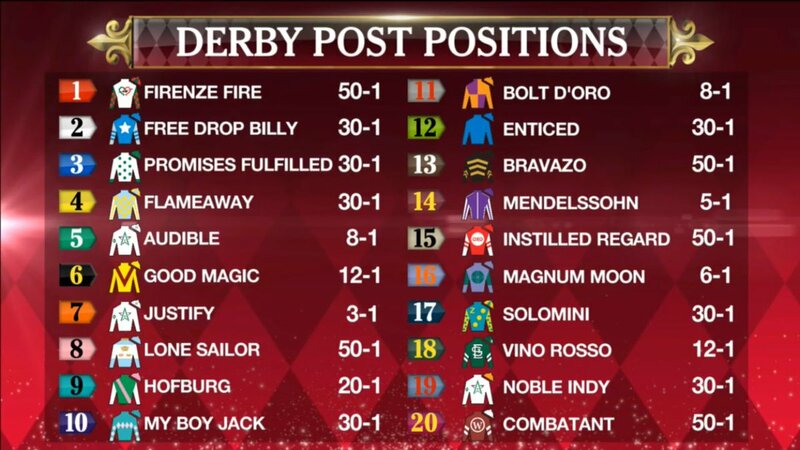 The post positions have been drawn and the morning lines have been set for Kentucky Derby 144. The favorite is starting from a solid spot. Justify is in gate No. 7, sitting cozy outside a pair of fast pace-setters, Audible and Good Magic, with a pair of closing long shots, Lone Sailor and My Boy Jack, to his outside. Justify isn’t the only elite horse with a favorable draw. None of the “good” horses in the field are doomed by a bad draw, and many are clumped together. Mendelssohn and Magnum Moon, the second and third-highest odds in the field, are separated by one gate. Santa Anita runner-up Bolt d’Oro and Florida Derby winner Audible round out the top five at 8-to-1. Two horses that will bring plenty of value to the table at 12-to-1 are Good Magic and Vino Rosso. Two tips from a backside insider: bet early and bet often.